The 133rd Royal Canadian Henley Regatta wrapped yesterday in St. Catharines, Ontario. A small but feisty group of Winnipeg rowers competed in the historic regatta earning some very promising results. Riley MacCharles showed speed and confidence racing the Single. He finished 2nd place overall in the U23 Men’s 1x event 6.45 seconds behind the event winner, and 5th place in the final of the Senior Men’s 1x. The Gauthier sisters, Casie and Kaelyn, won their heat in the Senior W2- and raced through a very tough head wind to a 5th place overall finish in the event final. They also raced in the Senior W2x event and finished 4th in the heat. 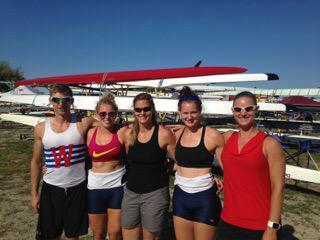 The Guathier’s teamed up with Amy Kroeker and Christina Blouw in the Senior W4- and finished 5th in their heat. Kroeker and Blouw also raced the Senior W2- to a 3rd place finish in their heat.